Four days of fun, meeting friends, playing and testing thousands of board games in Essen is near. One of our new game - Bronze - will be there. 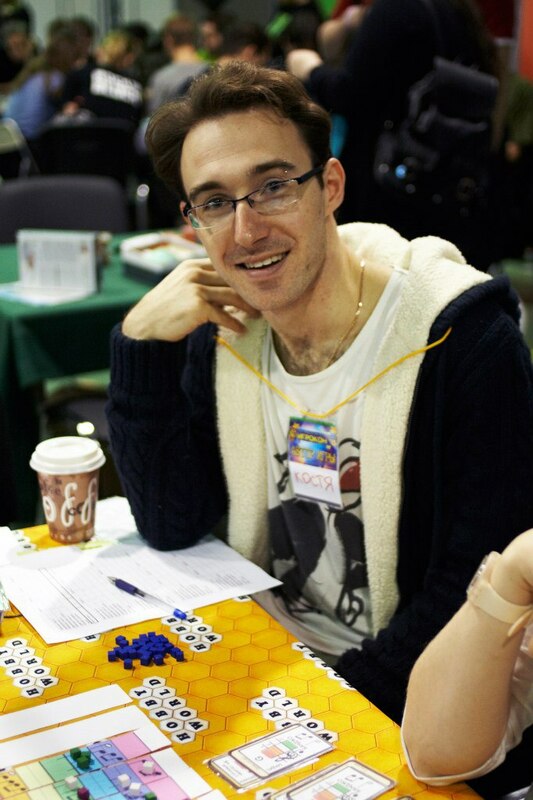 First acquaintance with the game and its author has happened during IgroCon 2016 - the biggest Russian festival of board games and family entertainments. The game was named Jazz Band and had an entirely different setting. So how has it happened that musicians became the settlers - read in the interview with Konstantin Domashev, author of Bronze. - Hello Konstantin! 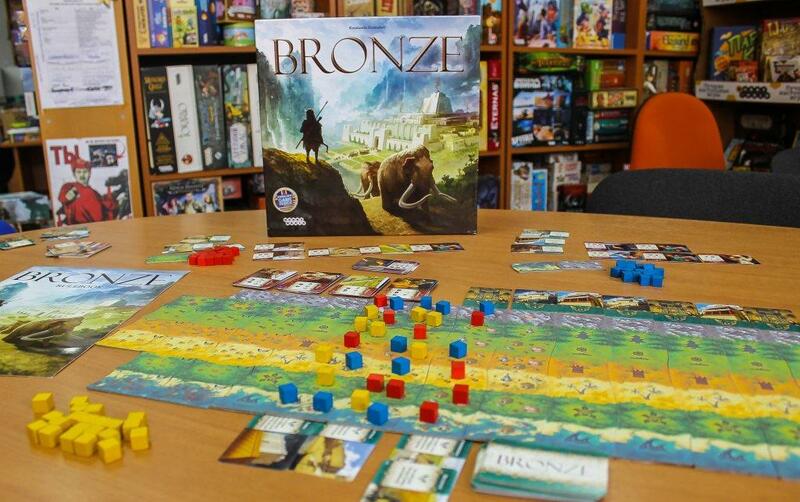 Bronze is the game in the setting of Bronze age, but, as I know, from the beginning your idea was different? - Yes and the game was called Jazz Band. We were collecting jazz orchestra and the game field was a stave where players were placing notes. Technologies cards were Musicians cards, players take them into the orchestra and got an ability to place the particular number of notes. For example, violin allows placing note in the high tonality, contrabass in the low and so on. Musicians were activating each other just like it’s happening in Bronze, so the mechanics the same. When Nikolay Pegasov [art director in Hobby World] saw Jazz Band at IgroCon [Russian festival of board games and family entertainments] he said: “What?! Music? That’s not interesting!” But he was playing and he liked it very much. So we have started to think about new setting, there were a lot of options and choose Bronze Age. Musicians are technologies, what creating your matrix. - So settlements were notes in the beginning? - Yes, notes. Quarter, half, whole and others notes. I’m not a musician; the idea was hitting me during watching Whiplash - the movie about a drummer. It was some kind of flash of light: a game about jazz band! I had started learning the music science, and I admit one more time, that I’m not a musician and had never learned any solfeggio and stuff. But I wanted to make the game truly from the side of the real world of music. I remember one my friend has told me: If the game will be cool, will be playing well but will not perfect from the theoretical side – it still be good. But if there will be everything perfect from the theoretical side and it will be bad like a game – it’s fail. Nobody needs it”. Eventually, Bronze has nothing about music in it and I like the result. - Why did musical setting leave aside? - Some of my friends, who had seen the game in the previous setting, sometimes are telling me: “It’s pity that there is no more music”. But I’m agreed with Nikolay. Music is the very interesting theme, but pretty strange for a man who has nothing common with music. He would come into a store, see a game where the game field is a stave and… what? I think he will be confused. Because he understands nothing in it. People who have a deal with music or children who forced to visit music school every week and they again see a stave in a game… [laughing]. Generally, there is a question: who will be playing in this game? It’s missed for the both of possible audience. Bronze Age is a universal thing. Besides, I’m delighted of the art in the game, thank you, artist! - Did you consider any other setting? Except for Bronze Age. - Yes. First of all – underwater world. We would be searching deep of the ocean, gradually go deeper. Another option, which I liked, is birds. We would be a leader of bird packs [Laughing]. The game field would be a city where the top is roofs of skyscrapers and the bottom is trees. And birds are making nests on the different levels. Other words, settlements now were nests in that version. I was imagining a design in Angry Birds style, but as I said, I glad to see Bronze Age setting. - Is Bronze your first game? - First published game, yes. - And it isn’t first developed game? - It isn’t first. The first my game was playing by Nikolay at the same IgroCon, before Jazz Band and he didn’t like it. When he had played Jazz Band he said: “That’s much better!” [laughing] In two words, that was a game about tax collectors in Space. Planets are producing resources and players (collectors) have to balance between tax collecting and bankrupt a planet. We have to take maximum possible taxes and not to destroy planet’s economics. Just like in real life. - Are you playing board games? - Of course. I’m a participant of the Guild of Board Games Designers since 2012. It’s Russian organization but everything had started in Saint-Petersburg. I’m fan of euro type of board games, where a game demands counting, thinking. My favorite author is Stefan Feld (The Castles of Burgundy, Brugge, and others). I’m aligning on him, collecting his games. Actually, I like so many games! My collection is over 70 board games and I’m not ready to cut it. There are some of them: In the Year of Dragon, Concordia, Battlestar Galactica, 7 Wonders, Mombasa. - That’s great. So you are working on board games since 2012? - Yes, just since my entering into the Guild. But generally, some thoughts were visiting me since childhood, when I saw the very first game with throwing dice and moving meeple mechanics. I was looking at it and thinking that it’s needed to figure out something more interesting. I was painting something, creating, but of course, it was not serious. I had not any experience. I think that author can create modern board games only if he has enough experience in playing these games. I know that other designers in the opposite: if you are playing other games a lot – you inevitably will imitate, replicate their mechanics. In their opinion, only a man with “free mind” is able to create something fresh and new. I’m disparately disagreeing with it. Of course, creating a board game isn’t a compilation of someone’s else ideas, but you have to understand the level and reality of modern games, and you can understand it only by playing. A lot. Because the progress is never stopping, new mechanics are appearing (of course it’s not so often as 5-7 years ago but still). Author has to monitor it. So, when I came into the Guild, I have understood that all my ideas aren’t fitting. I have started developing, “Space tax collector” was the first, and Jazz Band-Bronze became the second one. I’m working on third one now, but let’s leave it without details. - Is it active dispute among board games designers? Play to get and experience or leave your mind free? - I wouldn’t call it so. It’s just different concept of designing. Majority in the same camp as I. Honestly, I think it’s pretty strange to create board games without playing in it. - Is board games designing your main employment? - No, it’s a hobby for me. I’m a lawyer, working and living in Saint-Petersburg. Only on Thursdays, on the Guild’s meetings, I’m busy with my hobby. And since it’s only a hobby – it’s my favorite employment. And I’m thinking that it’s right apportionment. When you are working on something that’s you like – you’ll receive much better results.